Another vintage chronograph and new brand on the blog, an Aero Neuchatel. 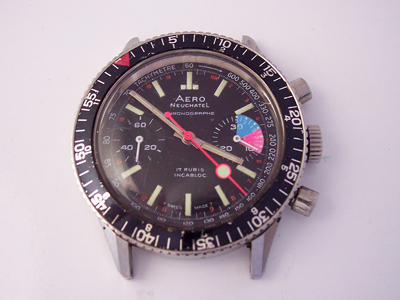 The brand name ‘Aero Neuchatel’ is owned by the company Aerowatch S.A. and was first registered in 1973. With the introduction of quartz watches in the early 1970’s, I can only speculate that Aerowatch S.A. set up this sub-brand to focus solely on contemporary wristwatches given that the parent company had built a reputation for creating more classical timepieces. Aerowatch S.A. has been in existence since 1910 and has produced mainly high quality pocket watches for sale in international markets. The company was owned and run by the Crevoisier family before being sold to the Denis Bolzli in 2001. The change of ownership proved to be something of a new beginning for the brand and by 2005 a new range of wristwatches had been developed, drawing heavily on the classical styling of previous Aerowatch timepieces. Production was moved from Neuchatel to Signelegier in 2008 and since then the company has continued to create mainly mechanical watches in the classical style. Here is an example from their current collection. You can see the rest of their current range on the website: www.aerowatch.com. The watch in this post arrived running but the chronograph wouldn’t start, stop or reset so something was obviously amiss. Opening the watch revealed a Valjoux cal. 7733 in decent order but the caseback gasket had turned to mush and the two chronograph operating levers were both loose on the movement – Sherlock Holmes wasn’t needed this time to help figure out why the chronograph wasn’t working anyway! The previous owner must have really forced the pushers as the heads of both retaining screws had been broken off and were rattling around inside the case, one is highlighted in the picture above and the second was trapped deeper inside the movement. Once out of the case, I noticed that the entire movement and the inside of the case were covered in a film of oil. Close inspection of the dial and hands revealed that they too were covered in oil. Not good. After prolonged exposure it’s possible that the dial print or paint could lift from the dial during cleaning, but on this occasion I had no choice but to ‘bite the bullet’ and remove the oil as the coverage was too heavy to leave it as it was. Here is a picture of the dial half way through cleaning – you can see the difference between the original matt finish on the left and the oil covered shine on the right. The case was stripped down and cleaned too, and all traces of the oil were also removed from the hands and the inside of the crystal. I can only assume that oil must have been “pumped” into the barrel the last time the watch was serviced as it was still half full even though a good percentage of it had already seeped out. With the movement serviced, the operating lever screws replaced and everything cleaned up, the watch could be rebuilt. The last thing to do was to fit a new caseback gasket and the job was complete. Regular readers may have noticed that the watch bears a resemblance to another vintage chronograph which I’ve written about several times on the blog, the Nivada Grenchen Chronomaster (an example here). Side by side, while almost identical in terms of case size, the Aero has a larger diameter dial and slimmer bezel which makes it wear larger on the wrist. They are both great chronographs and well worth adding to your collection if you get the chance.